SAN ANTONIO, Texas – The SBC Foundation awarded a $25,000 grant to the Hispanic Association of Colleges and Universities (HACU) to enhance HACU’s Internet web site and e-communications reach to faculty, administrators, students and program directors at HACU member colleges and universities, and to the larger community. 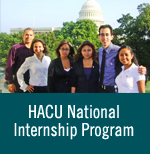 HACU will enhance its current web site at www.hacu.net and web site activities to provide a more active outreach through e-newsletters and e-brochures to targeted populations such as Hispanic faculty, administrators, program directors, students, federal agencies and HACU corporate partners. HACU’s corporate and federal partners will be provided expanded access to general academic data and statistics for their recruitment, as well as for collaborative efforts that can lead to new cooperative ventures with HACU and its more than 300 member colleges and universities. Electronic dissemination of information will be targeted to Hispanic faculty at member institutions on upcoming development, training and leadership programs, as well as grant and research opportunities. Aspiring college students, parents and high school counselors can utilize the information for academic, scholarship and career planning needs. HACU represents more than 300 colleges and universities serving the largest concentrations of Hispanic higher education students in 26 states and Puerto Rico. HACU also represents an international membership of colleges and universities throughout the Americas and in Spain. The SBC Foundation is an independent foundation funded by telecommunications giant SBC Communications Inc. and its family of companies. The SBC Foundation addresses community needs in education, economic development, health, human services, culture and the arts. Since its formation in 1984, the SBC Foundation has distributed nearly $600 million in grants, United Way support and employee outreach programs.